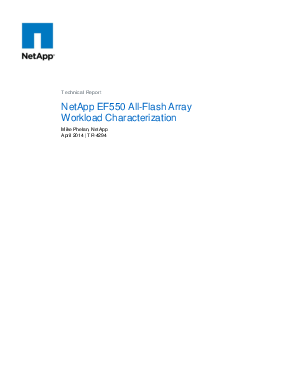 The NetApp EF550 all-flash array provides a robust platform for delivering exceptional performance to mission-critical applications. The EF550 flash array leverages the latest in solid-state disk technologies along with a strong heritage of handling diverse workloads and providing superior business value through the acceleration of latency-sensitive and high-I/O applications. This technical report provides an overview of workload characterizations performed on NetApp EF-series all-flash arrays across a wide variety of I/O types - with best practices and observations based on extensive test data. Characterizations include IOPS, throughput, and latency under varying block loads and RAID levels, SSD rebuild times, EF540 and EF550 performance comparison, and usable capacity sizing guidelines for various protection levels. If you are considering deploying an EF-series flash storage array in your environment, this is an essential technical resource to insure proper configuration and maximum performance.